In the global world, there are three environment issues, namely Climate Change, Clean Energy and Sustainable Development, which seeks to reduce greenhouse gas emissions. 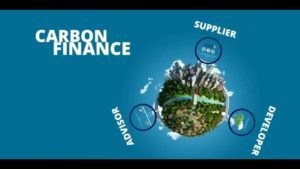 In the environmentally hazardous world, Carbon finance explores the financial implications of living in a carbon-constrained world, a world in which emissions of carbon dioxide and other (GHGs) carry a cost or a price. Carbon finance is a generalized term which deals with the projects that increase resilience to climate impacts and reduce emissions. The World Bank group acts on the concept of carbon finance through Nationally Determined Contributions, or NDCs. It has also created the World Bank Carbon Finance Unit (CFU). The emissions reductions are traded in carbon market through Kyoto Protocol’s Clean Development Mechanism (CDM). Under CDM of the Kyoto protocol, Certified Emission Reductions (CERs) are a type of emissions unit (or carbon credits) issued for emission reductions achieved by CDM projects and verified by a DOE (Designated Operational Entity) under the rules. The voluntary supporters to carbon finance also support and develop carbon finance projects that promote renewable energy initiatives such as domestic biogas and clean cook stoves, and sustainable agricultural practices. While majority of the poor people reside in rural areas and their basic livelihoods depends on the state of their natural environment, which is coming under increasing threat from climate change. Renewable energy sources and climate-smart agricultural methods; not only improve their living conditions but also help to mitigate climate change. While the world, the world-bank group, Kyoto protocol and voluntary supporter companies to climate change, all together vouch for carbon finance to deal with emerging problem of GHGs emissions, the availability of carbon finance has created opportunities for entrepreneurs who are developing sustainable energy projects and for which access to finance has long been a major constraint to expanding renewable energy technology (RET) projects, especially for small-scale energy projects.